For the first time in 39 years since the 1977 event 26 DB were welcomed warmly by Brixham YC. 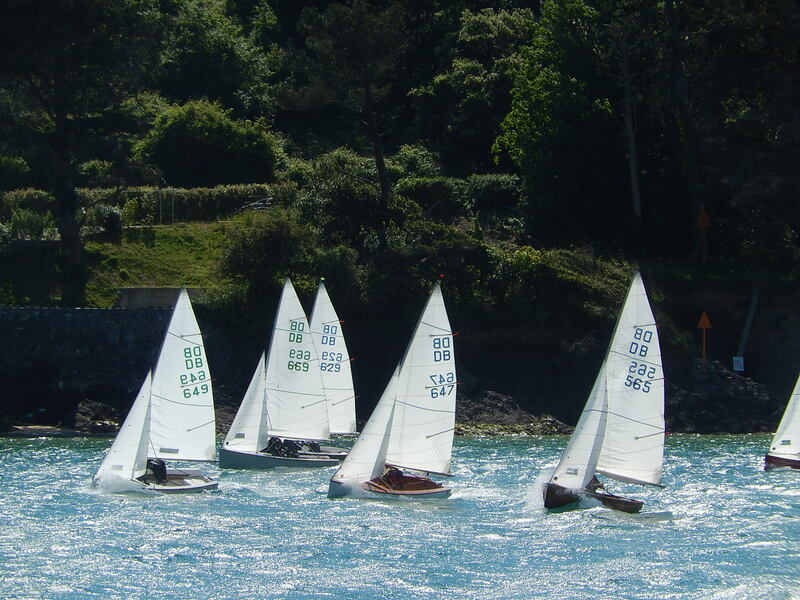 The entry of 26 was made up of 9 DB from Bosham SC, 8 from Poole YC, 3 from Thornbury SC, 2 from Royal Cork YC, 2 from Island Cruising Club, 1 from Weston Bay SC and one unaffiliated. The Race Officer set courses well away from the land out in the middle of Torbay and for the first three days racing we enjoyed mainly moderate W or NW breezes which enabled good racing in relatively flat water. The first two points series races were won by Nigel and Jack Young in Pa Pa II with Pete Hewitt and Chris Locket in Merlin in second place. The third race sailed back to back with the second on Tuesday was won by Colin Blewett and Chrissy Campbell in Alice with Merlin achieving another second. The fourth points race started in the usual NW breeze but almost as soon as the fleet crossed the line the breeze began to fail. 30 mins later no one had managed to round the windward mark and at least one boat was considering joining in the 29 ER fleet over near Torquay! Then as per the Sailing Instructions the Race Officer cancelled the race and we waited for some breeze. After nearly an hour there was some breeze from the East sufficient to make another start. Then after the first leg the wind began to fail again and the Race Officer hoisted the Shorten Course flag. Those who had read the Sailing Instructions closely knew that all they had to do then was to cross the finish line which was near the Leeward mark. Those who had not read the S I did the sausage leg before finishing. Thus Alice scored another 1st position and David and Fiona MacFarlane in Yellow Peril were second. So after 4 races and discards being applied Nigel Young in Pa Pa II needed do better Peter Hewitt in Merlin in the 5th Points race to take the Championship Cup home. Conditions were ideal for this race with a steady NW 4-5 breeze with sun. After the standard three laps of triangle, sausage & triangle Pa Pa II led the fleet home with Michael Hewitt and Steve Creasey in Snazzie in second place. The full points series results can be viewed by clicking here. And it would be a shame not to mention by far the oldest boat in the fleet which was DB 136, Merganser. sailed by Michael Sykes. Michael has restored the boat built by his father in 1952. This entry was posted in DB Weeks, Uncategorized on August 23, 2016 by Tim. This entry was posted in DB Weeks, Events and tagged Brixham, DB Week 2016 on June 3, 2016 by Tim. DAYBOAT SAILORS WILL BE ON HAND TO TAKE YOU OUT TO EXPERIENCE THE THRILLS AND EXCITEMENT OF DAYBOAT SAILING. NO WET FEET, JUST STEP OFF THE PONTOON INTO A DAYBOAT AND ENJOY A SAIL IN POOLE HARBOUR. MEET AT POOLE YACHT CLUB (BH15 4AQ) IN THE NORTH ACEDEMY ROOM FROM 11:00AM ONWARDS ON THE DAY (TEA AND CAKES AVAILABLE) OR ON THE DAYBOAT PONTOON AND BRING SOME WATERPROOF CLOTHING. This entry was posted in Uncategorized on April 8, 2016 by Tim. The DB Committee under the leadership of Bob Davis has arranged with the kind cooperation of James Hewitt that his newly built boat, DB 676, which is the latest to be built, will be shown on the Stand C68 in the Great Hall at Alexandra Palace on the weekend of 5th and 6th March, 2016. This annual show must have the greatest number of dinghies, sailboards, etc that you can experience in Europe at least. Also it is in a fine venue and a splendid opportunity to catch up with all things DB if you come along to the stand. 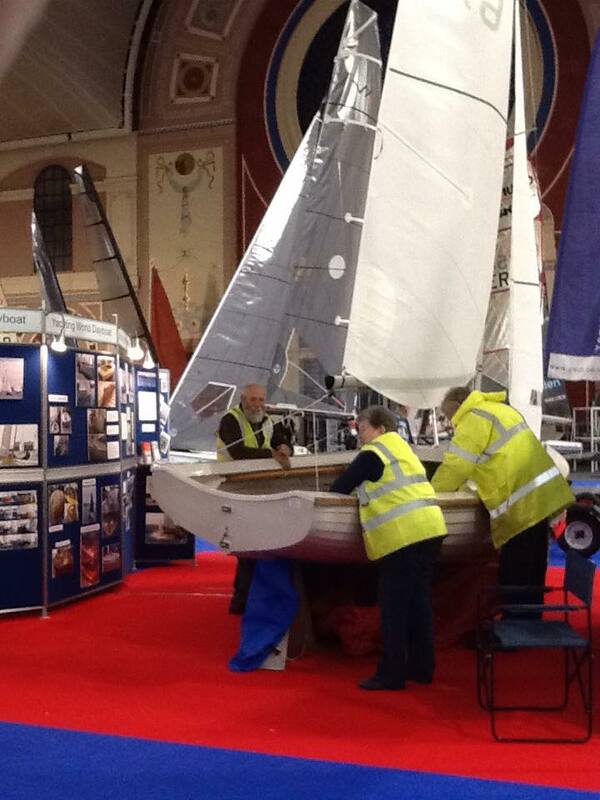 This entry was posted in Events and tagged Alexandra Palace, Dinghy Show, featured on February 20, 2016 by Tim. This entry was posted in DB Notes on January 8, 2016 by Tim. The 2015 National Championship created history in that the first three boats were helmed by members of the same family. 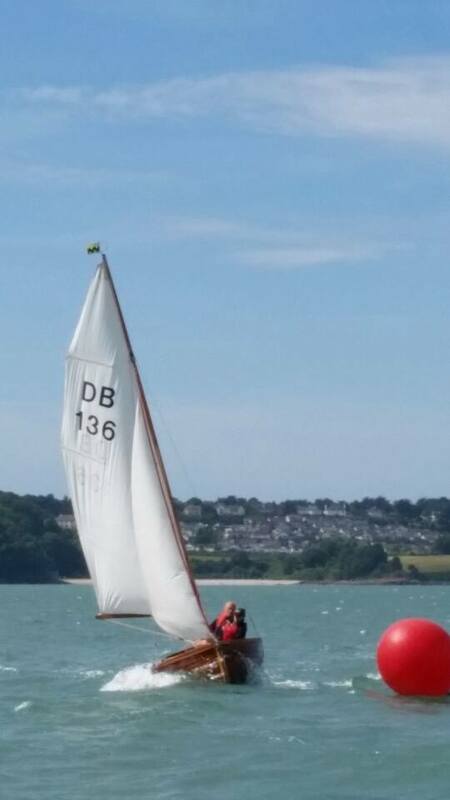 Peter Hewitt sailing with Chris Locket in DB 669, Merlin, achieved first place with 5 points overall. 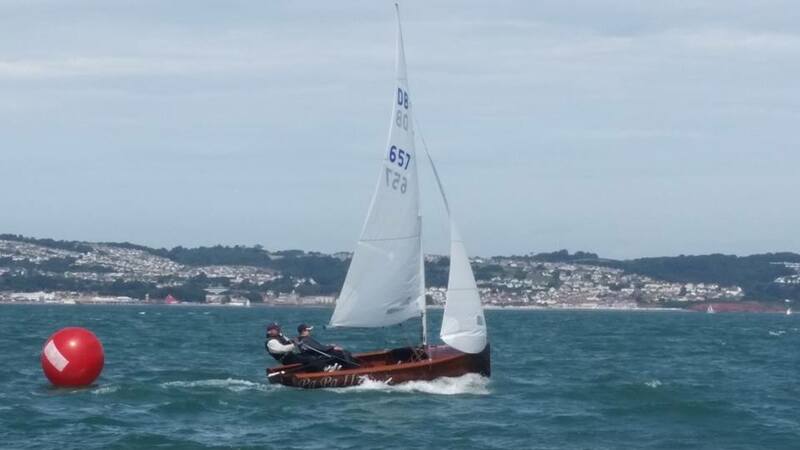 One point behind in second place was Michael Hewitt crewed by Natalie French in DB 649, Mandarin, . And James Hewitt sailing with Rachel Bullingham were third overall with 9 points in DB 629, Kerfuffle. The week began on Sunday with a modest south westerly breeze of no more than Beaufort force 3 for the first points race increasing to force 4 for the Opportunities race held back to back. This entry was posted in DB Weeks on June 13, 2015 by Tim. This entry was posted in Events on May 26, 2015 by Tim. The Entry Form, Notice of Races and Provisional Sailing & Social Programme can all be found here. This entry was posted in DB Weeks, Events on February 14, 2015 by Tim. Kath Davis has produced a fine issue containing a wealth of information, some of which yoy really need to know and some of real interest. AND advance notice of the important DB Week survey that will be hitting your mail box any time now. This entry was posted in DB Notes on January 4, 2015 by Tim. What would you like to see in DB Week? This entry was posted in DB Weeks on November 4, 2014 by Tim.